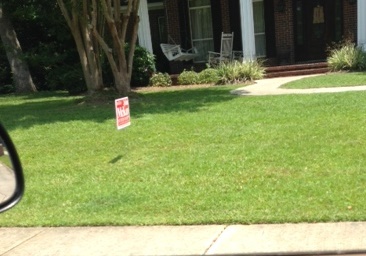 SRHS CEO Holland: Vote for John McKay…..
At least that is what the yard sign in front of his house says anyhow. You would think SRHS would implement a no political stance policy with all the goings on. My understanding is that some of the law firms involved have done the same. Also, I saw a really good post on here last week about the whole debacle but then it disappeared before I got the chance to read it in its entirety. Bring it back! Also why would anyone at SRHS especially in a position as CEO even put themselves in such a position to generate talk? Seems to me that this CEO placed the sign in his front yard to cause people to talk. Looks like the SRHS folks are getting upset over the posting of this picture over at SRHS Hopes Facebook page. Someone from the SRHS has contacted the page owner about the placement of personal information, like this picture taken from a public road, and threatened legal action. Of course CEO Holland supports John McKay for re-election. He has been the main water carrier for this group of hospital mismanagers for some time now. Remember when McKay stated that his appointee to the SRHS BOT, Morris Stickland, was handling the investments for the pension and Holland bragged about Strickland’s abilities? Holland has always carried out Strickland’s orders that come from McKay and as long as he is a member of the JCBOS Holland will have his overpriced position. Hell, McKay and Strickland even covertly ran the international search committee to replace Chris Anderson. After looking worldwide they found the perfect yes man already in the building. This was someone they felt could release the “unknown negative financial news” with a strait face in the first weeks of his tenure. $88,000,000,no problem. Just take it from the pension fund. Tommy Gotdon how point on you are good sir ! Not only did they pick a good yes man but one who could sell it from the pulpit of his church. He took to having his dept dir meetings straifht to his church. Because, who would lie or mislead or wordsmith in a church?